But where I cannot know. In the land where the dead dreams go. Age will bring me today? Wordless I stand raped by silence. Ya da da da, Ya da da da. I hear the soft note! Oh my, my life’s gone by and where am I? And aren’t the boys up there just sweet! An animal look, wild and free! I NEVER TURNED THE OVEN OFF! My cat! Narrator: St Agnes’ Eve – Ah, bitter chill it was! Sharp sleet patters against the windowpane. Guests: Hail! Health to horseman, hawk, and hound. Narrator: Still she slept an azure lidded sleep, an azure sleep. Shone upon fair Madeline’s breast. The faded moon made a dim silver twilight. Tinct with cinnamon, candied apple plum and gourd, dates. Everyone from silken Samarcand to cedared Lebanon. Porphyro: Now my love awake, or I shall drowse beside thee. Madeline: Porphyro, thy voice! Sweet tremble in mine ear. Narrator: Her heart is lost, she knows not where to go. Madeline: Prophyro, my heart is lost in thine, my love. Odour with the violet, solution sweet. Narrator: St. Agnes’ moon has set. There are no ears to hear, no eyes to see. Chorus: Storm! Down, glide the dark stairs. Hurry! Make no sound! Shh! Storm! Roar, wild winds roar! Roar! Narrator: The long carpets rose. The door upon its hinges groans. These lovers fled into the storm. The Beadsman, after a thousand Aves told, slept. He slept among his ashes cold. 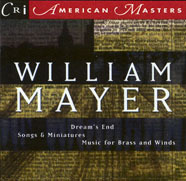 Eight instrumental and vocal works by Mayer. Order online from New World Records or from Amazon, ArkivMusic, etc. Performers: Iowa Brass Quintet; Members of the St. Paul Chamber Orchestra (William McGlaughlin, conductor); New York Brass and Woodwind Ensemble (Emanuel Balaban, conductor); Robert Nagel Brass Trio; The Peabody Conservatory Chorus and Orchestra (Gregg Smith, conductor; Arthur Weisberg, conductor; Catherine Rowe, soprano; Albert De Ruiter, narrator).